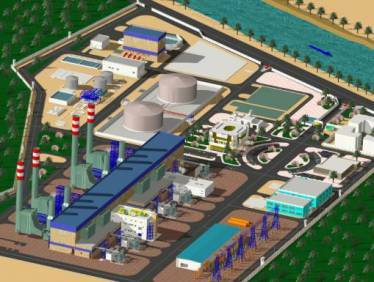 Egypt is building the Giza North 1500 MW Combined Cycle Power Plant, a $1.3 billion project. The goal is to improve the security and efficiency of electrical supply in a sustainable manner. The project consists of (6) – 250MW gas turbines, (2) – 250 MW steam turbines and (4) – heat recovery steam generators. The Giza North project is being built by an Italian contractor. Portland Bolt was chosen to supply the 60,000 pounds of galvanized anchor bolts due to the urgency of this project. In addition to manufacturing and galvanizing this product on an expedited delivery schedule, we also were required to have all of the threads magnetic particle (MT) and liquid penetrant (PT) tested prior to galvanizing to guarantee that the threads were free of cracks. The entire order was inspected and approved in Portland, Oregon prior to shipping the anchor bolts to Egypt. Portland Bolt shipped 20,000 pounds of anchor bolts via air freight, with the balance shipping ocean freight. Portland Bolt was able to quickly complete this project due to our 94,000 square foot manufacturing plant which can easily handle large volume, large diameter orders, our extensive steel supply network that can get raw material to us in a timely fashion, and our in-house galvanizing. We met our customer’s delivery requirements and kept the fast pace project moving forward.